Singapore's Christmas in the Tropics is a (mostly) secular festival, celebrated with a highlight of shopping, entertainment, Christmas lights, and Santa showing up in full furs despite Singapore's sizzling, humid weather. The shopping districts of Orchard Road and Marina Bay explode in a shower of light while adjoining malls and shopping centers put on extended hours and special deals to attract sightseeing tourists. Then, when New Year's Eve ticks down, countdown parties will pull out all the stops. If you have a hankering for celebrating the holidays in the tropics, here's a rundown of what you can do during Christmas in Singapore. 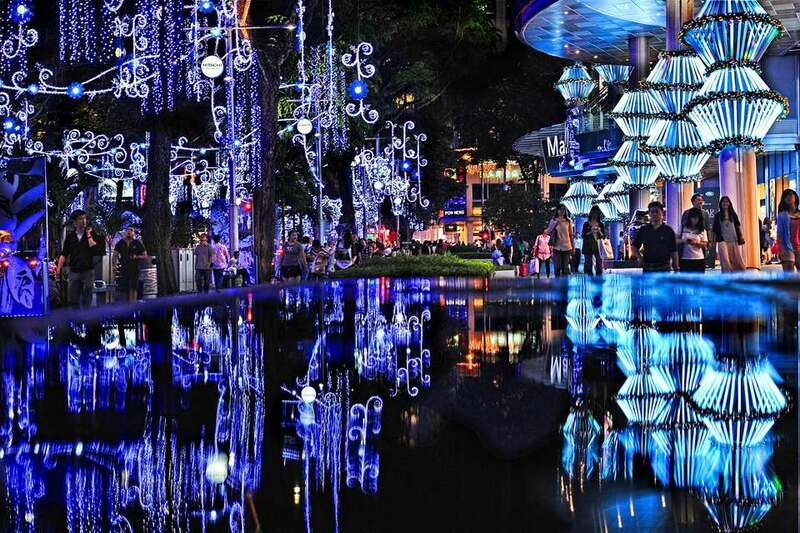 Every Christmas in Singapore, Orchard Road's streets glow with stunning light shows that blaze through the island's prime shopping and entertainment districts. This, combined with the late mall hours and promotions put in place during Christmas season, make nighttime shopping in Singapore way more fun. The Orchard Road Light-Up, a spectacular street-length light show, stretches about two miles down from Tanglin Mall to Plaza Singapura. Fortunately for tourists, there are a number of great hotels on or near Orchard Road where guests can stay among the Christmas lights. Another great destination for some holiday light-ups this time of year is the Great Christmas Village, which will be set up in the plaza in front of Ngee Ann City from November 15 to December 26. Featuring a collection of holiday events and activities throughout the season, this winter village has something for all ages including amusement rides, a two-level carousel, and visits from Santa Claus at the Santa House. 25 different food vendors will also be on-site at the Village's dining area. To see as many light-ups as possible during your trip, you can also opt to take a guided bus tour aboard a two-decker bus operated by Duck & HiPPO Tours, which takes guests through some of Singapore's most popular lighting displays. Shopping is the central activity for Christmas in Singapore. Outside of the Great Singapore Sale, the promotions and the freebies offered by Singapore's shopping centers are some of the lowest in the region, designed to hitchhike on the Christmas spirit and get Christmas bystanders to come in and buy some high-quality merchandise for their family and friends. The ION Orchard Shopping Mall on Orchard Road is a great place for holiday deals, especially at pop-up stores on Level 1 and Basement 4 and during the Europe Fair at B4 ION Station. Other great Singapore Christmas promotions include Christmas rewards at the Shoppes at Marina Bay Sands, the Christmas Wonderland in Gardens by the Bay, and MasterCard promotions at Paragon, Centrepoint, Forum The Shopping Mall, and Takashimaya SC. The tax-free shopping in Singapore also benefits tourists who come to spend Christmas in town; they can redeem the tax they pay on their shopping as soon as they leave the country. Singapore holds a number of parties to ring in the new year, one at Marina Bay and the Esplanade waterfront, and two others to be thrown at Siloso Beach on Sentosa Island. ZoukOut: Singapore's longest-running and most-awaited music dance festival will kick off on Siloso Beach, Sentosa, on December 10 and 11, 2018, uniting partygoers in a sea of music, dance and good vibes. Marina Bay Singapore Countdown: Singapore's foremost New Year party happens at Marina Bay on the evening of December 31, with fireworks and performances bursting forth against a highly-modernized backdrop. To mark the countdown celebration, a Wishing Spheres visual art installation will pour into Marina Bay. Singaporeans write their wishes for the New Year onto 20,000 giant "wishing spheres", and the spheres will be set afloat on December 31. Singapore Sentosa Countdown: At Siloso Beach on Sentosa, a far more raucous party will ring in the New Year. Stilt-walkers, dancers, and fire-eaters will amplify the excitement launched by the fireworks. The party starts on December 31, 2018, at 8 p.m. at Sentosa Siloso Beach. More information: continue to this article on Christmas and New Year Parties in Singapore to get more details on these parties, tickets, and transportation to the party venues.